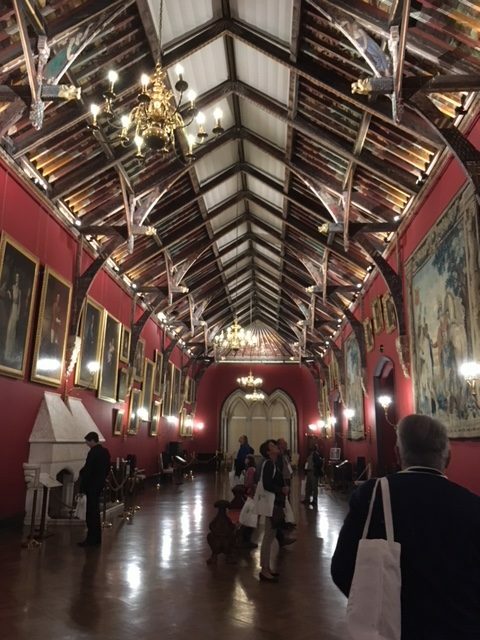 As Chair of the BHL Members’ Council, I had the privilege of attending the 25th Meeting of the GBIF Global Governing Board convened in Kilkenny, Ireland, 15-18 October 2018. 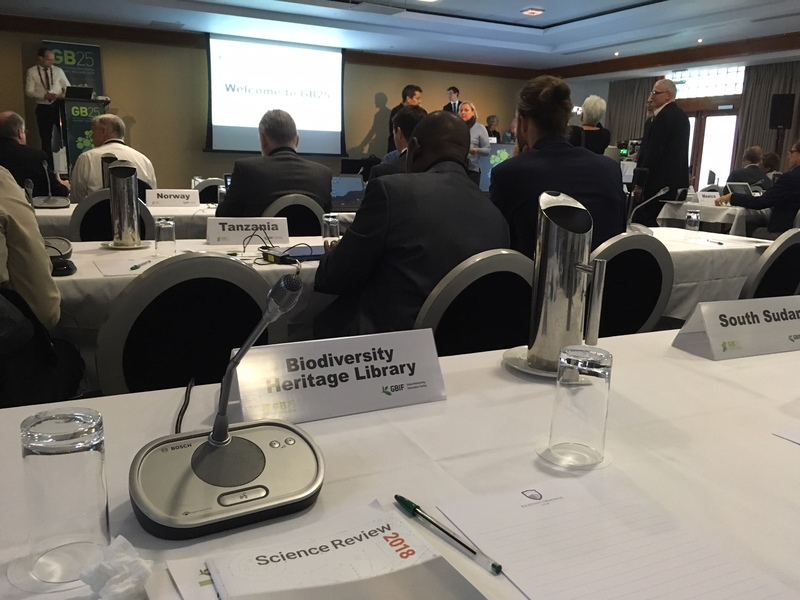 I represent BHL in its capacity as an Associate Participant in GBIF at the governing board meeting. BHL has been a participant since 2014. 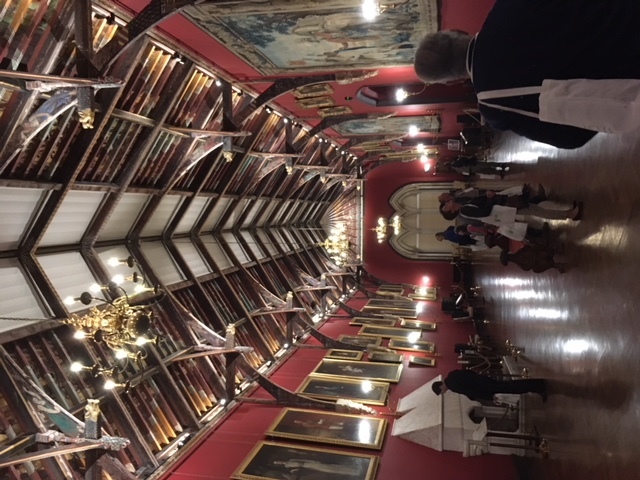 Tour of Kilkenny Castle as part of the opening reception at the GBIF 25th Governing Board Annual Meeting. Photo credit: Constance Rinaldo. 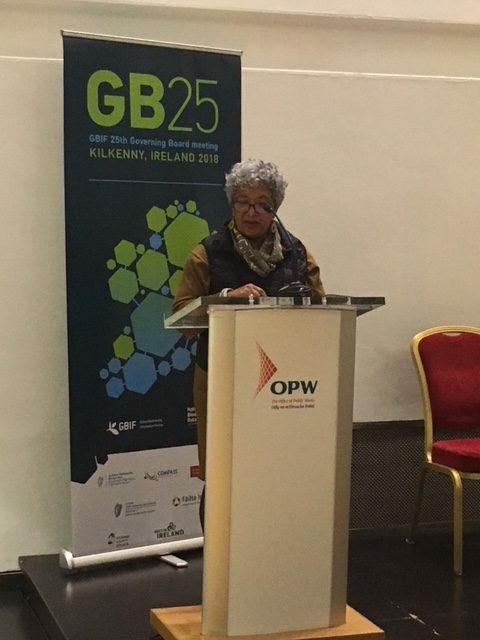 GBIF Governing Board Chair Tanya Abrahamse (former CEO South African National Biodiversity Institute) and Donald Hobern (GBIF Executive Secretary), along with the host, Liam Lysaght (National Biodiversity Data Centre, Ireland) led the meeting. Abrahamse and Hobern provided an overview of GBIF activities over the past year, including a discussion of the GBIF Strategic Plan Goals and Work Program updates. The various GBIF Committee chairs (Science, Nodes, Budget) all reported the past year’s activities. Around 4 July 2018, GBIF reached the one billion record mark. The GBIF 26 Governing Board meeting will be part of the Biodiversity_next joint conference in Leiden, The Netherlands. 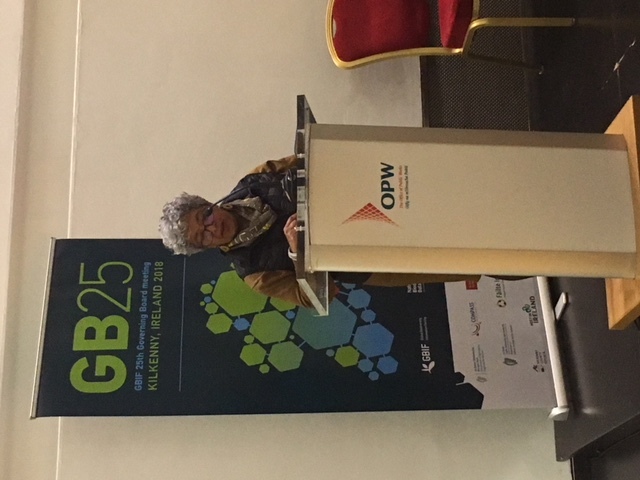 Tanya Abrahmse, chair of GBIF governing board, speaking at the GBIF 25th Governing Board Annual Meeting. Photo credit: Constance Rinaldo. 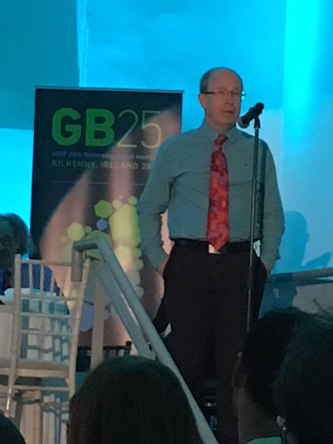 Donald Hobern, Executive Secretary of GBIF, speaking during the GBIF 25th Annual Governing Board Meeting. Photo credit: Constance Rinaldo. Public Session of GBIF Governing Board. GBIF applications and relevance: progress and next steps. 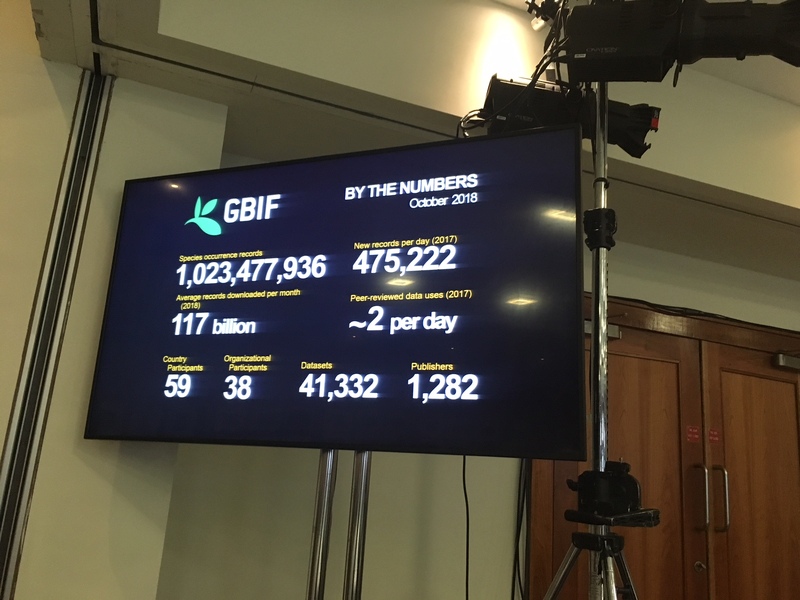 GBIF by the numbers. Photo credit: Constance Rinaldo. All GBIF delegates and others from the greater biodiversity community in Ireland were invited to the public session. Many of the talks focused on data discovery and mobilization, improving functionality and relevance to policy. Presentations were introduced by Tim Hirsch (GBIF). View from Constance Rinaldo’s seat at the GBIF 25th Governing Board Annual Meeting. Photo credit: Constance RInaldo. The winners of the 2018 Young Researchers Award and Ebbe Nielsen Challenge were presented at the end of the public session. The Young Researchers Award honors projects that foster innovative research and discovery in biodiversity informatics and provides financial support for winners. Raquel Gaião Silva, University of Algarve, Portugal: Raquel is a Master’s student in International Science/ Marine Biodiversity Conservation. She has used GBIF mediated data in her work on climate-driven changes in seaweed distribution in Atlantic Iberian marine forests. Kate Ingenloff, University of Kansas Biodiversity Institute is a doctoral student who used GBIF mediated data along with time-specific environmental and behavioral data to develop better niche models for highly mobile species such as pelagic birds. The Ebbe Nielsen Challenge annual prize honors the memory of Dr Ebbe Schmidt Nielsen, a principal founder of GBIF and leader in biodiversity informatics. The six recipients shared prize money, some provided by the Swedish Research Council. Videos of the public sessions of the meeting are available on the GBIF website. 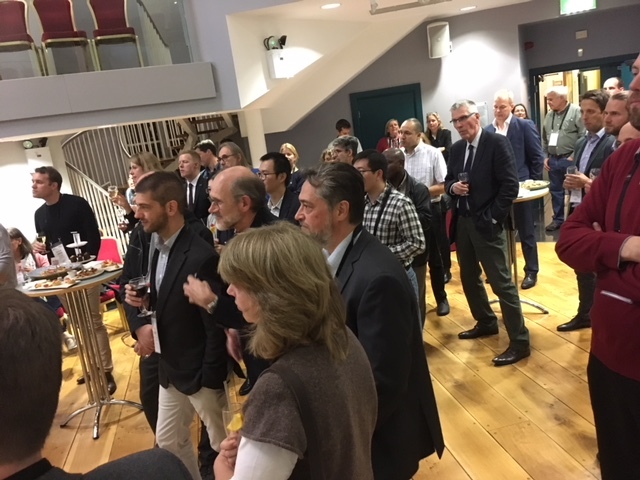 Attendees at the opening reception of the GBIF 25th Governing Board Annual Meeting. Photo credit: Constance Rinaldo. I had some productive, informal meetings with BHL partners and potential partners providing opportunities to explore new partnerships or deepen existing ones. During the reception and other networking events, I learned about GBIF’s Biodiversity Open Ambassador program, a chance to promote the principles of open data sharing in presentations, whether or not the work is about GBIF. GBIF will provide slides and information or you can develop your own to add to appropriate presentations. Discussions with Ana Casino of the Consortium of European Taxonomic Facilities (CETAF), Donald Hobern and Dmitry Shigel (GBIF), Dmitris Koureas (TDWG) and Patricia Koleff (BHL México), among others, determined that BHL’s future plans will augment interoperability in the biodiversity community and that BHL is a critical resource for many GBIF participants.